With the flowering of the cherry trees in Eliot Circle comes the spring crop of student awards and fellowships. We salute the following Reed students for their scholarship, dedication, and inventiveness. Two seniors in biochemistry and molecular biology, Gabe Butterfield ’12, of Sedro-Woolley, Washington, and Michael Gonzales ’12, of Round Rock, Texas, have designed a grassroots project in Djibouti this summer for Davis Projects for Peace. Molly Case ’12 will work with SOIL in Haiti. Diarrheal diseases are the leading cause of death in African children under five years old. Misuse of antibiotics in the developing world is causing bacterial resistance. Doctors in Djibouti are uncertain whether the drugs they prescribe are curing their patients’ diseases or making them worse. Gabe and Michael will test for the presence and strain of two common diarrheal pathogens, shigella and salmonella. Different strains can cause different symptoms and possess different levels of antibiotic resistance. They will then determine, the level of antibiotic resistance and the efficacy of antibiotics, sourced both locally and from U.S. suppliers. Two economics majors from Massachusetts have won Environmental Studies Fellowships. Nick Pittman ’13, of Cambridge, will use the grant to pursue an internship with the Vermont Agency of Commerce and Community Development to work on recovery projects related to the devastation of Tropical Storm Irene last August. Molly Case ’12, of Sudbury, will intern with SOIL (Sustainable Organic Integrated Livelihoods), a nonprofit cofounded by Sasha Kramer ’99 that is dedicated to protecting soil and transforming waste into resources in Haiti. 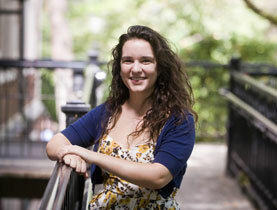 Portland resident Lillian Karabaic ’13 is Reed’s first Udall Scholar. Lillian was one of 80 students selected for the scholarship from 585 applicants representing 70 colleges and universities. The scholarship, which provides up to $5,000 for expenses, is open to sophomores and juniors planning to pursue careers related to the environment. In her application, Lillian wrote that she seeks to create a world where it is easy, affordable, and safe—and even preferable—to live without a car. She is an advocate for bicycles, being a key to creating cities that are livable and healthy. Literature major Julia Reagan ’12, of Petaluma, California, received a Fulbright Scholarship to study the political dimension of fairy tales in Weimar Germany. 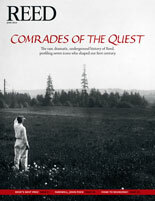 Between the two world wars, political activists began writing fairy tales that were distributed in party magazines to attract youth and their families. The tales range from tales of socialist and communist utopias to social critiques of current conditions. During her Fulbright year, Julia will study the Weimar fairy tales, which are archived in Berlin, with a particular interest in their attraction as a medium for political activists of the time. “In Germany, fairy tales have a storied role in the national cultural heritage and have traditionally been an important didactic tool,” she says. 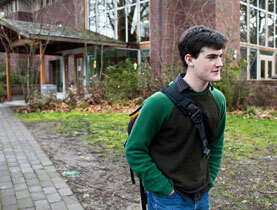 Daniel Carranza ’12, of Chicago, and Sean O’Grady ’12 of Howard Beach, New York, both German majors, received Fulbright teaching assistantships, which allow them to teach English in Germany. The U.S. student Fulbright program provides recent graduates with opportunities for personal development and international experience. The program operates in more than 140 countries. Nine hundred grants are awarded annually. Physics major Max Gould ’12, of Gig Harbor, Washington, has won a fellowship from the National Institute of Standards and Technology, one of the world’s leading research organizations and home to three Nobel Prize winners. Open to students with scientific majors, NIST fellowships provide hands-on experience, working elbow to elbow with researchers on cutting-edge technology.